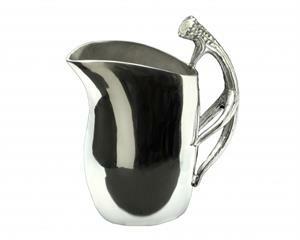 Pitch your boring drinkware and entertain your guests with this handsome Antler Pitcher from Arthur Court. An incredibly defined antler creates the handle for this piece, attaching at four points for extra support. The smooth finish of the pitcher gleams against the antler's textured lines for a striking contrast within the handcrafted, aluminum design. Size: Diameter: 9.5" / Height: 11.0"